UK - UK pig meat production totalled 70,200 tonnes in September, a 1 per cent increase compared to the same time a year earlier. This was the slowest growth rate recorded since the start of 2014. The total number of clean pigs slaughtered in the UK also recorded only a minimal increase of 1 per cent year on year, to 828,600 head. The small annual growth in slaughterings in September was noticeable across the whole UK. England and Wales recorded a minimal increase of 0.5 per cent while Scotland’s clean pig slaughterings was almost the same a year previously. Northern Ireland recorded the largest increase of slaughterings in September, of 3 per cent year on year. 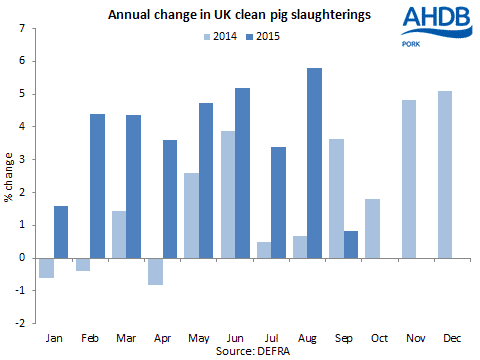 The number of clean pigs killed in the first nine months of 2015 was 4 per cent up on 2014 at 7.8 million head, while UK pig meat production was also up, by 5 per cent year on year to 662,500 tonnes, to the end of September. However, in September, average carcase weights fell by 0.7kg year on year to 81.0kg. Sow and boar slaughterings in September recorded an 8 per cent increase compared to the same point in 2014, at 20,300 head. This is the fourth consecutive month that cullings have been above the levels seen last year. While it may be that the increase in slaughterings is due to a lower profitability for producers, it could potentially be due to a higher replacement rate of older sows amongst the UK breeding herd. Nevertheless, sow and boar slaughterings for the year to date were down by 1 per cent on the year at 183,100 head.